Currently, Ms. Williams serves as the Director of Political Action and Legislation (PAL) Department of District Council 37 (DC 37) of the American Federation of State, County & Municipal Employees (AFSCME) AFL-CIO, New York City’s largest public sector municipal labor union, representing 121,000 members and 50,000 retirees. Before joining District Council 37, she was a consultant for the United States Agency for International Development (USAID) in Washington, DC and Beirut, Lebanon. From 1994 – 1998 Ms. Williams worked for the National Democratic Institute for International Affairs (NDI) as the Country Program Director of the Institute’s Nairobi, Kenya office. She directed the Institute’s Program – on “Women’s Political Participation and Leadership Development”. Upon her return to the United States in 1998 Wanda served as a Consultant for the United States Agency for International Development (USAID) – Office of Transition Initiatives (OTI) on its Lebanon Anti-Corruption Mass Media Campaign project. 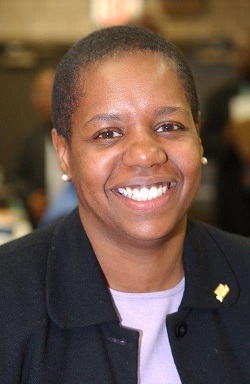 Before joining NDI, Ms. Williams headed a Washington, DC – based consultancy firm of Williams and Associates which was the successor of Gibson-Williams which worked with organizations such as the Women’s Political Caucus, Planned Parenthood, NARAL on lobbying, campaign training, state affiliates empowerment and reproductive health issues. In addition to several issue/candidate based campaigns. Earlier, Ms. Williams was the Eastern Region Political Director for the Democratic National Committee (DNC) under the chairmanship of Paul Kirk and Ronald Brown where she worked with all of the political parties on the Eastern hemisphere of the country – from Maine to the District of Columbia. Her territory also included Democrats Abroad, Guam, Puerto Rico and the Virgin Islands. Ms. Williams has worked on four Presidential campaigns as a political organizer and delegate tracker for former Vice President Walter Mondale in 1984, the Deputy National Political Director for the Dukakis campaign in 1988 and as a State Get out the Vote coordinator for the Clinton-Gore campaign in 1992. In 1993, Ms. Williams served as a consultant to the Department of Health and Human Services (HHS) for President Clinton’s “Working Group on Welfare Reform, Family Support and Independence”. A native New Yorker Ms. Williams spent most of her political career doing work throughout the U.S, in Africa and the Middle East. Before leaving New York, Ms. Williams worked in the New York State Administration of Governor Mario Cuomo and in the New York State Assembly and Senate as a legislative assistant and Chief of Staff respectively. Ms. Williams has taught Political Science courses at Gannon University, Taft Institute of Politics and Government and Rutgers University as a faculty in Residence of the Eagleton Institute’s Center for American Women in Politics.